According to research from Fiserv, financial institutions that actively market mobile banking have experienced an average adoption rate that is twice as high as those that don’t. Are you using all of the channels possible to migrate transactions and inquiries to your customer’s mobile devices? How can financial marketers use the multiple communication channels at their disposal to promote channel migration? How do we encourage both the sign-up and utilization of the mobile channel that can help reduce costs and potentially generate revenue. Below are nine ways institutions with are promoting mobile banking. One of the best ways mobile banking has been promoted comes from Fifth Third Bank. Not only did they encourage sign-up for mobile banking on the ATM screen as many banks do, but they also included a QR code at the bottom of their transaction receipt. The use of a QR code appeals to the more advanced smartphone user while being a perfect way to electronically link to the appropriate app. The customer may decide to scan the code immediately or do so later when they reference the receipt to balance their account. 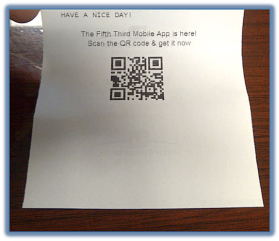 Another very inexpensive, yet effective method of promoting mobile banking using QR codes in on customer statements or on the envelopes of standard customer communication. Chase bank does this very effectively, automatically directing customers to the correct app store for their device. 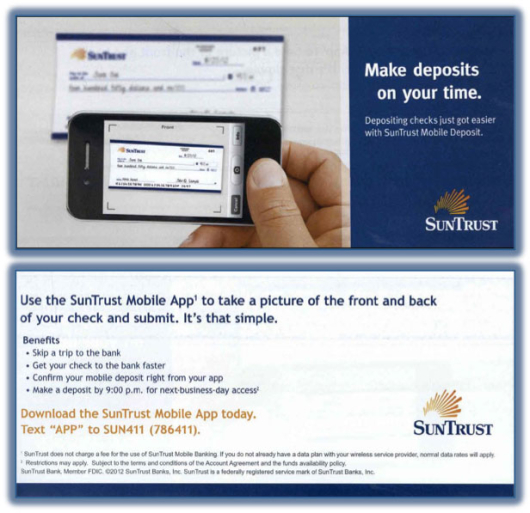 In addition, statement inserts are a low-cost way to reinforce statement messages or branch promotions as done by SunTrust. There are obviously many ways to promote the download of a mobile banking app in a branch as well as many ways to offer incentives to either the customer and/or branch employees for the completion of a download. The benefit of any branch-based promotion is the ability to have dialogue with the customer around the advantages of using mobile banking as well as providing a great opportunity to answer any questions or address any concerns the customer may have. Since customers almost always have their phone with them when visiting a branch, this is another channel where QR codes can be very effective, especially on brach POS materials and transaction receipts. An email campaign is a great way to target online banking customers or customers doing a large number of balance inquiries monthly. Some banks are even targeting customers who use the branch extensively for check deposits, promoting the remote deposit capture function of mobile banking. The key with any email campaign, however, is providing a direct linkage to either the mobile banking location on your web site or to the mobile banking application itself. 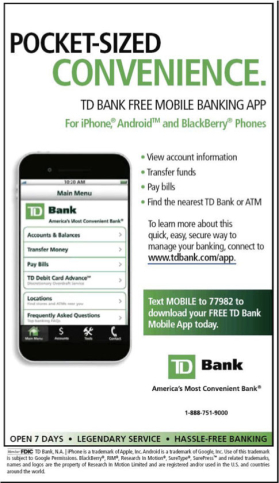 Using banner advertising as well as adding pop-up banners when customers are viewing your web site using their mobile device is a highly effective targeting technique that can promote your mobile banking application. With banners, various tests can be done at a relatively low cost, with learnings applied to more expensive channels such as direct mail. As with most other electronic and digital marketing, it is important to provide a link to either a mobile banking landing page or to the appropriate mobile banking app. 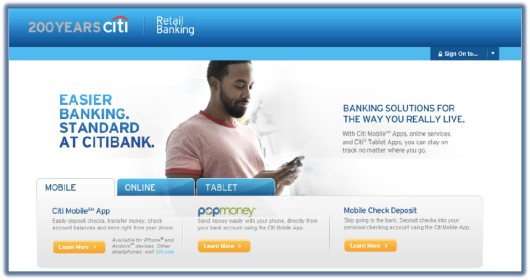 Recently, most banner ads focus on the benefits of mobile check deposit as done by Citi below. With the vast expansion of smartphone ownership and the potential economic and competitive benefits of mobile banking migration, several banks are using direct mail as part of a multichannel strategy to increase mobile banking penetration and usage. While more costly than many of the channels above, the lift from adding targeted direct mail to the marketing mix has offset the higher costs of this channel, increasing the net volume of qualified users faster than direct mail or electronic channels alone. 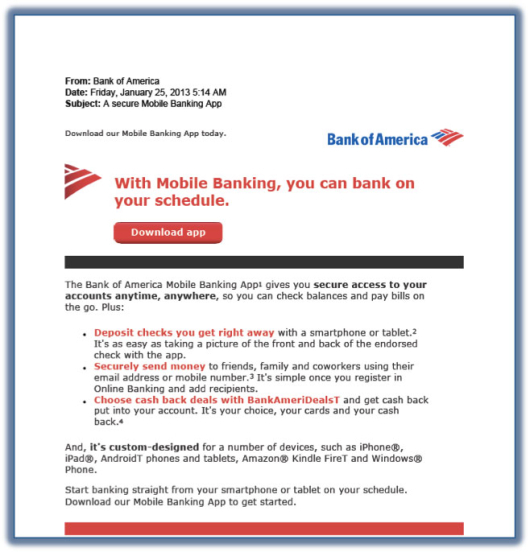 Don’t forget fans and followers when you are building a mobile banking marketing strategy. Avid social network users are some of the most prolific smartphone users, making them a great target audience for the benefits of mobile banking. Make sure your Facebook and other social pages are optimized for mobile viewing and they include easy links to your mobile banking application jump pages or the correct app store. While not used as extensively as other channels, traditional print advertisements are still used to reinforce the benefits of banking via the mobile channel. Usually focussing on mobile check deposit, mobile rewards programs or new applications such as an ATM finder, this channel is an effective way to display market leadership in mobile banking. More and more financial institutions are beginning to ask for mobile phone numbers as part of the new account opening process to enable better communication with customers. If you have SMS permission, this channel can be effective when used with an incentive for mobile banking sign-up along with a direct link to the download page in the app store. While this channel needs to be used judiciously, there is also the ability to integrate the message with your bank’s rewards program offer of points or discounts on merchandise. A recent Juniper Research report entitled ‘Mobile Banking: Handset and Tablet Market Strategies 2013-2017,’ finds that mobile banking is expected to grow at a compound annual rate of 18 percent to eventually reach one billion consumers in the next five years. This growth is being supported by many of the major banks increasing their investment in the mobile channel and by significant promotion of mobile banking through various media. As a result, it is more important than ever for every financial institution to grab their share of the mobile banking pie before it is too late. As you acquire new mobile banking customers, it is also easier to extend the collection of insight from the customer such as their email address (if you don’t already have a current address) and even their Facebook page or Twitter handle. The more data you have, the easier it will be to expand communication through additional channels. This can also be done at the point of sale as branch personnel are signing customers up for mobile banking. Jim Marous is a recognized financial industry strategist and publisher of Retail Banking Strategies for The Financial Brand. Marous also publishes the Digital Banking Report, a subscription-based publication that provides deep insights into the digitization of banking. There are 150 reports in the digital archive that are available to subscribers and subscriptions are available here. You can follow Jim on Twitter and LinkedIn. Tema Kelembutan. Gambar tema oleh imacon. Diberdayakan oleh Blogger.